The actual moment is a blur. I vaguely remember what he said – I’m bad about that. My brain skips around too much inside itself. I was too busy trying to figure out if it was real life to pay attention to his question. Then I was too busy being happy and staring at the ring so I didn’t even cry. I cry all the time. Literally. At commercials, movies, TV shows, songs, animal pictures…I’m a cryer. Are you tired of seeing ring pictures? Too bad. This is my blog. I cry about it now, though. 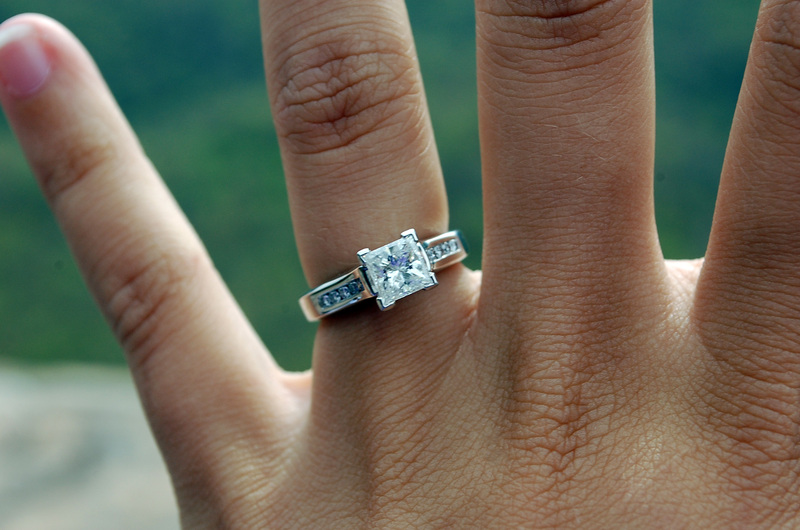 If I’m just sitting somewhere, or driving, or at work…anytime the proposal crosses my mind – I start to cry. Maybe not full on bawling, but I get choked up and teary eyed. I just love him so much. Planning the wedding is another story. I’m NOT a planner. I absolutely despise anything and everything wedding planning. Picking the dress was the only thing I was looking forward to, and even THAT turned into a semi-nightmare. It’s been bought, now. And I love it. So why can’t I just fast forward to March and have the planning phase behind me? Blerg. Any tips from you soon-to-be brides and/or newlyweds would be ENCOURAGED AND EMBRACED over here. Luckily my sorority sister and new blogger, Taylor, is like a wedding genius, so with her help along with my MOH Kelsey and my Mama, hopefully I won’t be a Bridezilla. To be Bridezilla you have to care, right? I’m so apathetic it’s disturbing. We also settled on a signature cocktail. Rum, sour mix, ginger ale, strawberry lemonade and fresh strawberries combined to create a yet-to-be-named dranky drank that we’ll be serving at the open bar. I’m thinking something along the lines of Southern Firecracker or Old Fashioned Firecracker…totes just brainstorming. Waaaaaah why can’t I just get J-Lo to come and do everything for me. Beaufort, my heart is yours! I love this blog! My tidbit of advise is make all your planning and arrangements deadline March 1st. That way the month you are getting married can be more about enjoying who is coming in town to visit and spending time with the people you love. Also, the day of the wedding, LET EVERYTHING GO! Don't worry if something doesn't go to plan. Let everyone else worry about it. That day is YOUR DAY! Expect that something will go wrong and just be prepared to overlook it and focus on having a good time. I know it will be wonderful so just enjoy. Your ring is beautiful! and I love the colors you picked out:) so classy! 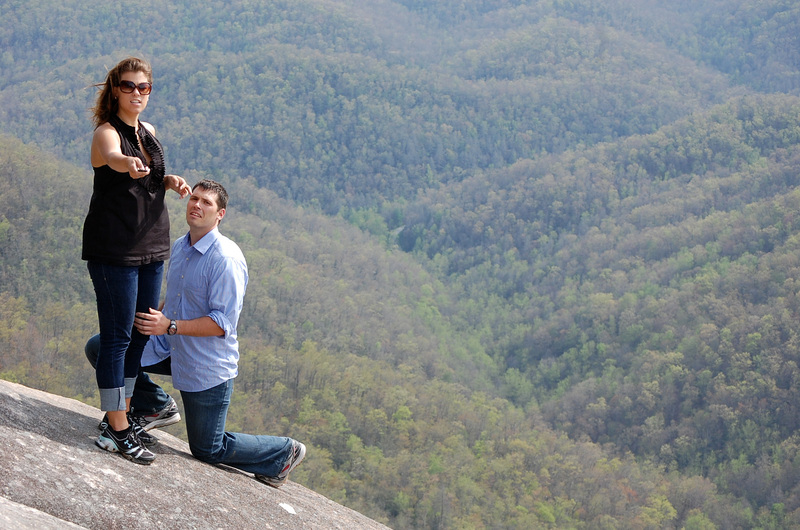 I know what you mean, I don't remember anything my husband said when he proposed. I don't remember a thing that the guy who married us said. I remember how I felt and what I was thinking though. Funny how that works. It looks like your friend has helped come up with great ideas! I think pinterest would be a huge help in coming up with awesome ideas. I wish it was around when I was planning my wedding. Great, truthful and honest. You are doing a very good job. I Love that You Love my son so much. I pray he will always treats you Well. If he doesn't he will not find me on his side. Thankful for such a talent and beautiful future daughter-n-law. You are a compliment and asset to Michael what more could I ask.